In a move apparently designed to remove hundreds of unsightly bicycles. from the roads in of Santa Clara to make room for more more automobiles. Santa Clara has created a tribute to Gas burning Nissans out of 340 bicycles. The City of Santa Rosa, in conjunction with Nissan of Santa Rosa, have commissioned Artists Mark Grieve and Ilana Spector to create a dynamic new artwork for the Santa Rosa corridor, which will be installed on Santa Rosa Avenue and South A Street in Santa Rosa. 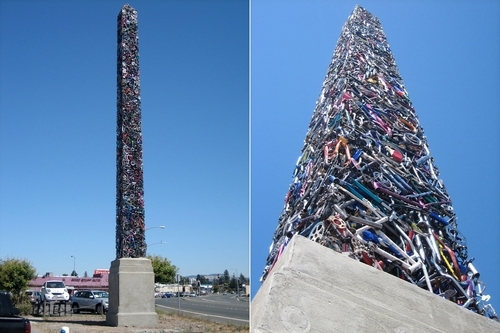 The Work, entitled, “Cyclisk,” is a sixty-foot-high (five-story) Egyptian-style obelisk made from recycled bicycles. I never expected such a noble move to remove pesky automobiles from the roads, from some where in California. Then again once rust starts settling in it will look like something one might see in one of the Governator’s movies.